Schematic illustration of the device structure of the WBPD. λ1 indicates shorter-wavelength incident light, λ2 indicates longer-wavelength incident light. Researchers at Toyota Central R&D Labs describe the first all solid-state wavelength-dependent bipolar photodetectors with fast response times and tunable switching wavelengths. The findings are reported in Applied Physics Express. "Optoelectronic sensors that can switch their photocurrent direction based on the wavelength of incident light are an important building block in novel optical logic gates, color sensors, and photocatalysts," according to Takashi Ikuno and Masaki Hasegawa at the Toyota Central R&D Labs in Japan in their latest report. However, existing wavelength-dependent bipolar photodetectors (WBPD) based on liquid electrolytes are too slow for future optoelectronic devices and logic gates. Ikuno and Hasegawa describe the first all solid-state WBPD, and not only demonstrate faster response times, but tunable switching wavelengths as well. In existing devices, two materials with different optical properties are used to create wavelength-dependent photocurrents carried by an electrolyte. However, the low carrier mobilities in liquid electrolytes makes the response times slow. 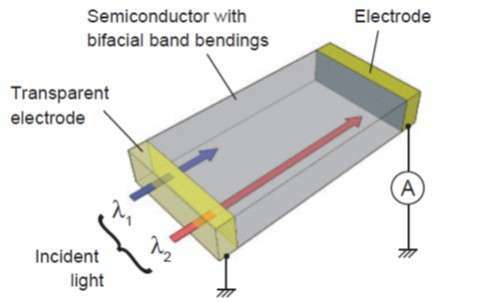 Instead, the Toyota researchers' calculations show that if they use a semiconductor film with a band structure that increases or decreases at both the rear and front surfaces – giving the band structure a U or upside-down U shape - it will be capable of photocurrents with wavelength-dependent switching. Their device exploits the wavelength-dependent penetration of photons in semiconductors. Shorter wavelengths are more readily absorbed than long, so shorter wavelengths will have a higher distribution of excited electrons near the front surface, whereas at longer wavelengths, the distribution is greater deeper in the material. Taking into account drift and diffusion processes, this causes photocurrents in opposite directions for short- and long- wavelength incident light. The thickness of the device affects the distribution of photoexcited carriers as a result of the wavelength-dependent absorption, allowing tunable switching wavelengths as well. The researchers demonstrate their approach using a tungsten disulphide film, with front and rear ends modified by oxidation and sulphurization. The faster microsecond response gave the device "significant advantages over previously reported wavelength-dependent photodetectors using molecules and electrolytes."